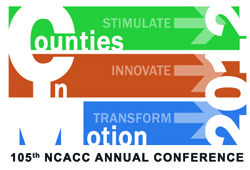 This week the North Carolina Association of County Commissioners (NCACC) held their annual conference in Raleigh. The School had a strong presence at the conference. Donna Warner did a great job of working with Patrice Roesler at the NCACC to develop sessions that would interest and meet the needs of the attending commissioners and managers. Thanks to everyone who agreed to participate. I spend most of my time at the conference out in the hallways talking with managers and commissioners, which unfortunately means that I don’t get to see many of our sessions. I do hear feedback from lots of folks, however, and they express great appreciation for our participation and for the School’s work in general. Here are the sessions that were offered by School faculty members. Vaughn Upshaw presented a pre-conference seminar on successfully managing change, which was offered as part of the Local Elected Leaders Academy. Jeff Hughes conducted a workshop on water and resilient communities, and Norma Houston did a session on local planning and preparation for disasters. Jonathan Morgan held a session on placemaking strategies for local economic development―I was able to squeeze into the back of the packed room for a few minutes. People were really engaged. Carl Stenberg participated in a panel on the perils of leadership, which was so popular that I couldn’t even get in the door. There were several off-site sessions on Friday afternoon. 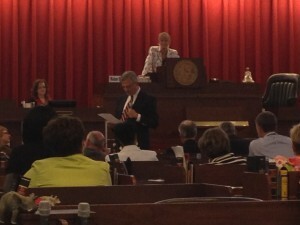 I attended the mock legislative session that was held in the House chamber of the Legislative Building. The idea was to give county commissioners the opportunity to get a sense of the legislative process and the balancing of policy issues that occurs when legislation is considered and debated. Norma Houston was heavily involved in developing the session, and she also presided as “Speaker of the House.” She was aided by Kevin Leonard, the NCACC Deputy Director and the leader of their legislative advocacy program. They were ably assisted by “Representative” Bob Joyce and “Senator” Frayda Bluestein. The commissioners learned procedure and then debated a proposed bill that would have given local governments, including boards of education, the authority to levy certain taxes without additional approval by the legislature. Notwithstanding persuasive arguments from Bob and Frayda, the bill was voted down by both bodies after spirited debate by the commissioner-legislators. I wish we had a video of Bob describing the “itty, bitty tax.” The idea of granting local taxing authority to school boards was a total non-starter for the commissioners. It was a wonderful session and the commissioners really got a lot out of it. I heard positive comments later that evening at the conference dinner from many of the commissioners who had participated. Norma was a formidable “Speaker”—remind me never to give her a gavel. County Management Fellowship Program. In an effort to encourage more MPA graduates to pursue careers in county government management, the NCACC is creating a county management fellowship program in partnership with ICMA. There is a challenge in replacing the current generation of managers as they head into retirement—the profession is not in vogue with young people and attracting them to county management is difficult. The decision to create the program was based on a report prepared for the NCACC this summer by intern Sana Khan, a rising 2nd-year MPA student at Carolina. The plan is to make five fellowships available this spring. Data Analysis. The NCACC is expanding their research efforts to provide county data analysis on a statewide basis. According to a memo shared with county managers by David Thompson, NCACC Executive Director, they “envision future technical training sessions, webinars, and symposia on current issues detailed in county data analysis, analysis which will drive public policy for increased county authority.” The effort is being led by Latonia Strickland, Legislative Research Analyst. Her first product is the 2012 County Map Book, which uses colorful maps to represent a variety of indicators that reflect the current state of our counties. It is a nice piece of work. Lunch-and-Learn Sessions for Legislators. The NCACC also is hoping to offer some lunch-and-learn sessions for legislators during the next session to give them a better understanding of county governments and the issues they are facing. The idea is not to lobby them about any particular issue. Instead, the goal is to provide a broader education and context for any number of issues. The person heading this effort is Alissa Willet, Legislative Grassroots Coordinator, who expressed a strong interest in partnering with the School on these sessions. 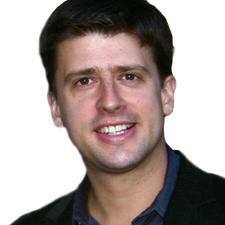 Dan Heath. I had the pleasure of introducing Dan for the general session on Saturday morning. Dan and his brother, Chip, have written two best-selling books about individual and organizational effectiveness. Dan’s session offered a preview of their next book on decision-making. They are gifted at taking academic research and making it accessible and practical for lay audiences. Dan is an engaging presenter, and he walked the group through common mistakes in decision-making and offered them a helpful process for making better decisions. It was very good. He also offered an impressive incentive for completing a survey about his presentation―a free advance copy of the new book will be mailed in January to everyone who completed the survey. The School’s relationship to the NCACC and their members is incredibly important. Many thanks to everyone who participated in this year’s conference. Special thanks to Ellen Bradley and her colleagues for staffing our information booth in the exhibit hall and for working the conference—Gini Hamilton, Marybeth Bundy, Emily Hinkle, and Leslie Meacham. I realize that it can take a lot of time, but I promise that our participation yields dividends for them and for us. Our partnership with counties has never been stronger, and it is because you are willing to step up and do things at this conference and in other programs aimed at elected officials. Thank you.